Hotel ibis budget Halle Peissen. Book online now! Free Wifi! 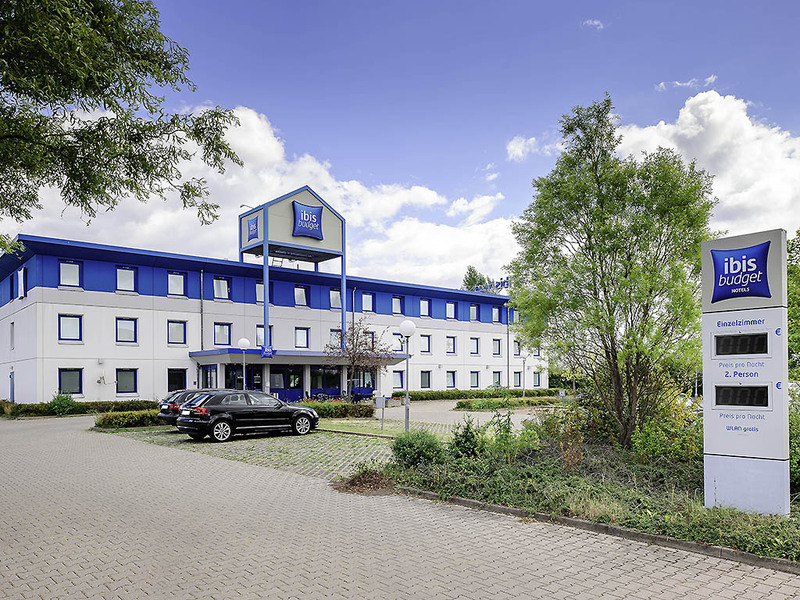 The ibis budget Halle Peissen is situated around 10 minutes from the city center and is easily accessible from the A9 and A14 highways. The hotel has 73 modern rooms, each of which caters for up to two adults and one child under the age of 12. Start your day with our delicious buffet breakfast and enjoy free WIFI access. We also offer free parking in front of the hotel. As above, receptionist was continuously rude. Breakfast was disappointing Room was very hot and window did not have fly screen it purported to have. Bed was hard No tea/coffee facilities in room Shower was weird! Generally a bit run down. Cleaner was lovely and seemed very efficient. Every time when I've stayed at Ibis hotel it was good. This time it wasn't . Outside was very hot and rooms didn't have any air-conditioning. I thought I'm going to die. It was horrendous. The hotel has what is needed for a one-night stop-over, but nothing more than that. The beds are ok, the bath is not good. Breakfast is good, considering the price. A coffee vending machine would have been nice, so we could get a cup of coffee in the evening. We have previously stayed at the hotel and have been able to reserve one room for one adult and one child and another room for one adult and two children. This no longer seems possible. We had to pay adult price for one child, which made the stay more expensive, and next time we may consider a better hotel, when the price is no longer as low as previously. Absolutely OK, and we managed to use the Automatic check-in then we arrived after the informationdesk was closed and no staff available. The floor is covered vith a carpetlike material that kan be dificult to keep clean, and there were som spots after lost something, We suggest, that by ronovating the hotel you use some easywashable material to cover the floors. I thought Ibis Budget is a kind of standard. Mistake! First, man in the reception didn't speak english at all, and even did't try to help us. Internet was not working, there were only 2 pillows for 3 persons in the room. Smell of dirty blanket or something similar, very low humidity and too high temperature spoilt the night. Very special shower was also for our joy. Water nozzle was situated at hight of ca 230cm. My wife, who is 150cm tall wanted to wash her bottom, but not standing on her hands. Do You think it's possible? And finally - breakfast. It was very poor. Absolutely no vegetables, not even cucumber. Choice of products was half of average. I regret I stayed here instead of Genshagen, as usual. Man in reception didn't speak english at all. No working internet. Low humidity and high temperature in room spoilt night. Shower had only &quot;water output&quot; at hight of ca 230cm, so my wife 150cm tall couldn't wash her bottom (try to do it yourself!)... Bad smell of dirt (swear?) in room. Breakfast very poor. No vegetables at all, even no cucumber. We waited for weeks to get an answer as to how much it costs to bring a dog and where on the website we could add the dog when ordering. NO ANSWER AT ALL. As for staying - again a VERY UNPLEASANT, GRUMPY; UNFRIENDLY RECEPTIONIST when we arrived. And it gives a VERY WRONG SIGNAL THAT HE STANDS GOSSIPPING WITH GUESTS OUTSIDE THE ENTRANCE. And as for the room. The room can hold UP TO 3 PEOPLE and still after all these years ONLY ONE HARDBACKED CHAIR in the room. You give &quot;Budget hotel&quot; a whole new meaning. YOU SHOULD BE ASHAMED OF YOURSELVES! The Hotel is remotely located. We faced with difficulties to find it. It was very dissappointed to realize that breakfast price for our kid was twice debited, so we had to pay extra 3.5 Euro. In our booking confirmation there were not ordered 2 kids breakfasts, but 3 for adults and 1 for kid. Unfortunately the receptionist demonstrated highly unpleasant behavior. He couldn't speak English at all, and refused to help us or give any advices to resolve payment discrepancies. I have to say that such a poor hospitality from his side spoiled the impression about the hotel on the whole. All OK: enough space for parking, clean room, efficient check-in, quiet at night, bill available right away, friendly staff. Called the reception to change my booking. The receptionist was very unwilling to guide me. I Wish it was possible to change booking without cancelling and rebook. Furthermore the payment for the first booking has not been returned to me, and the cancellation was a week ago.